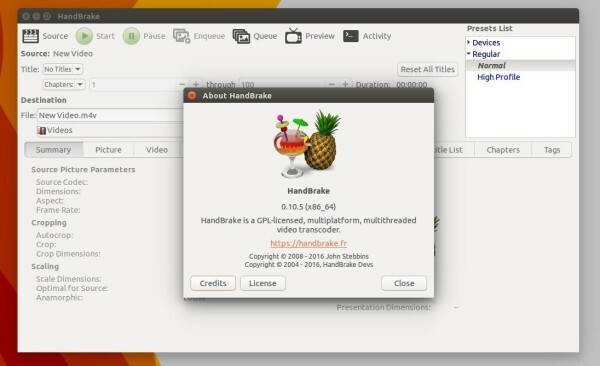 The popular HandBrake video transcoder has reached the 0.10.5 release one day ago. Due to licensing issues, the high quality FDK-AAC encoder has been removed from the official binary releases. This change affects all of the device presets on Windows and Linux. OS X is unaffected because it has always used coreaudio for aac encoding. The LibAV AAC encoder is still present though it does not support HE-AAC. Removal of FDK AAC from our binary releases. --enable-fdk is required for “non-free” builds if compiling from source. Updated x265 to 1.9 which brings bug fixes and performance improvements. Few minor bug fixes since the 0.10.3 release. This includes improvements in large AVI file handling. To revert back the stock version of HandBrake in Ubuntu, just reinstall handbrake via Software Center which will ask to remove handbrake-gtk and/or handbrake-cli.